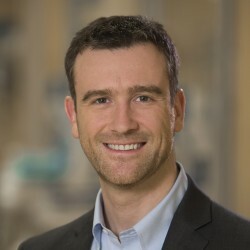 Ewan Goligher studied medicine at the University of British Columbia and trained in internal medicine and critical care medicine at the University of Toronto. Upon completion of his clinical training, he undertook Doctoral studies in physiology at the University of Toronto, completing the PhD in 2016. His research aims to delineate mechanisms of injury from mechanical ventilation with a view to prevention and treatment in order to improve outcomes for patients with acute respiratory failure around the globe. Mechanisms and outcomes of patient-ventilator interaction. Respiratory muscle injury from mechanical ventilation, and its impact on patient outcomes. Goligher EC, Ferguson ND, Brochard LJ. Clinical Challenges in Mechanical Ventilation. Lancet 2016;387:1856-1866. Goligher EC, Fan E, Herridge MS, Murray A, Vorona S, Brace D, Rittayamai N, Lanys A, Tomlinson G, Singh JM, Bolz SS, Rubenfeld GD, Kavanagh BP, Brochard LJ, Ferguson ND. Evolution of Diaphragm Thickness During Mechanical Ventilation: Impact of Inspiratory Effort. Am J Respir Crit Care Med. 2015;192(9):1080-8. Goligher EC, Kavanagh BP, Rubenfeld GD, Ferguson ND. Physiologic Responsiveness Should Guide Entry into Randomized Controlled Trials. Am J Respir Crit Care Med. 2015;192(12):1416-9. Goligher EC, Kavanagh BP, Rubenfeld GD, Adhikari NK, Pinto R, Fan E, Brochard LJ, Granton JT, Mercat A, Marie Richard JC, Chretien JM, Jones GL, Cook DJ, Stewart TE, Slutsky AS, Meade MO, Ferguson ND. Oxygenation response to positive end-expiratory pressure predicts mortality in acute respiratory distress syndrome. A secondary analysis of the LOVS and ExPress trials. Am J Respir Crit Care Med. 2014;190(1):70-6.